Hello and welcome to Day #9 of DEFGHIJK Theme Week. 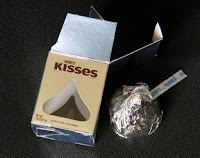 We've covered previous letters of this alphabet series this past week, and today we'll finish up with the letter "k."
Today, "K" is for Hershey's Kisses and Trader Joe's Cocoa Drizzled Kettle Corn—two sweets with a long history in the U.S. 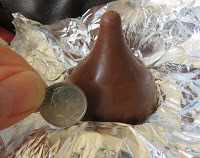 The Hershey Company* (gluten free) drop-shaped chocolate Kisses were first introduced in 1907. Today's larger-sized Hershey's Kiss was solid milk chocolate and wrapped in silver foil. It was fairly sweet, as one would expect with milk chocolate; and it was similar in taste to a Hershey's milk chocolate bar. 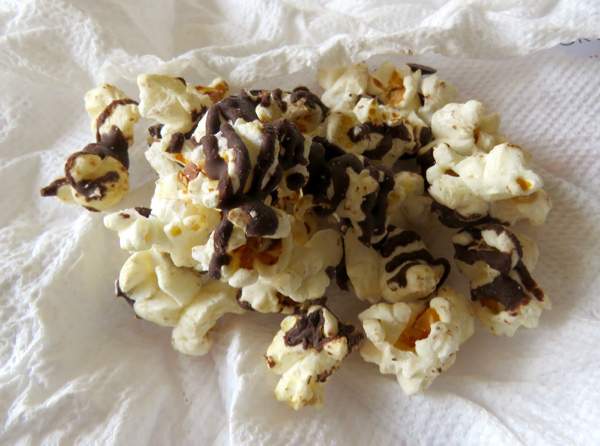 Kettle corn is a popped corn-based treat that's salty and sweet. Dutch settlers to the U.S made mention of it as early as 1776. Later, another new world food (cocoa) was incorporated. 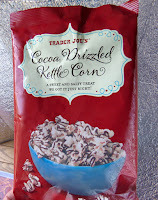 Today's Cocoa Drizzled Kettle Corn from Trader Joe's (Monrovia, CA) lacked the sugary varnish that often accompanies sweet popcorn treats. (Thank you!). This kettle corn maintained a crunchy, salty-sweet balance. The application of the chocolate flavored confectionery coating (sugar, palm kernel oil, cocoa...) was restrained and, again, well balanced. And the cocoa coating tasted like chocolate. *The Hershey Company (formerly known as Hershey Foods Corporation and/or Hershey's) was founded in 1894 by Milton S. Hershey in Derry Township, PA.